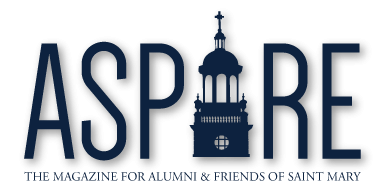 This year marks the 14th anniversary of SpireFest, the largest scholarship fundraiser at the University of Saint Mary. Each year, SpireFest brings hundreds together to raise money for USM student scholarships. More than 40 percent of our student body represent the first generation of their families to attend college, and just over two-fifths qualify for low-income federal aid. Without scholarships, college would be merely a dream for many of these students. Instead, it’s reality. This year, we’ll also be honoring the amazing work of Sr. Vickie Perkins. She’s touched thousands of lives and serves as an inspiration to thousands more. Whether you donate an auction item, sponsor a table, or come in your red-carpet attire—SpireFest is an event with a powerful impact! Visit stmary.edu/SpireFest for more details. Contact Sharon Clay, event manager, with questions at Sharon.Clay@stmary.edu or 913-758-6108.